Multiple modes of adjustability? Check. Super supportive seat with built-in handle for extra portability? You got it. Ergonomic seating is forever transformed with the E7 Stool by UPLIFT Desk, the stool that allows you to switch postures from sitting to perching, engaging more muscle groups and waking up sleepy legs while you work. Switching up postures throughout the day is one of the keys to staying healthy while you work. With the E7 Stool by UPLIFT Desk, this is easy. Start by gently leaning into the chair for a classic perching posture, or lower the stool to fully sit on it. As your workstation adjusts throughout the workday, so do you and the E7. Adjust in seconds via a height adjustment release located under the seat. Ideal for use as a side seat or complementary seating option to your usual office chair, you can have an ergo-friendly stool that allows you to tilt, rotate, and pivot your way to more active seating. 360 degree rotation is ideal for getting the best view and maintaining eye contact at collaborative meetings, and with the option to sit and perch at your sit-stand desk, you'll have all of the seating options at your fingertips (or behind). Work better with a little help from the E7 Stool by UPLIFT Desk. 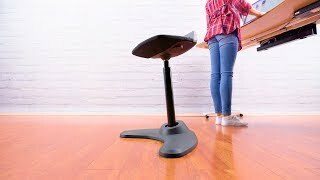 Height adjustment range 21" - 32.25"
Overall height 21.5" - 31.25"
How is the E7 Stool different from the Motion Stool? We love the E7, and we think you will, too, thanks to its ability to swivel and rotate while you're seated. The stool also features a handle on the back, so it's portable. Take the E7 to your last-minute meetings or impromptu brainstorming sessions when you need an on-the-go side seat. If you're looking for a different ergonomic stool or chair, pop into our chair comparison chart to see all of the features UPLIFT Desk's family of chairs has to offer. Can I use this at high or low desk heights? The 11.25" height range allows you to use the stool while seated or standing. At the stool's lowest setting, the stool will be 21" high. When you want to move to standing, you can "perch" on your stool by sitting on the middle of the seat and leaning back into it. Is this like a balance ball? While it is sort of like a balance ball, the E7 Stool allows much more stable movement at your ergonomic workstation than a balance ball. You also don't run the risk of popping it like you would a balance ball. Engage your muscles and feel better with the E7 Stool by UPLIFT Desk! While the E7 Stool is a comfortable addition to any sit-stand workstation, it doesn't lower as far as most chairs and does not come with lumbar support for all-day sitting. For these reasons we do not recommend using it as a full-time replacement for your office chair. Yes, you can move this stool easier than many other perch-able stools on the market today. The E7 was designed with portability in mind - just use the built-in handle on the back of the seat to pick up and move the stool to your next workspace. Is this chair okay for children? No, the E7 Stool does not go low enough to be safely used by children or anyone under 5 feet tall. I'm 6'2". Can I still perch on this? Of course you can! The E7 Stool goes up to 32.25" at its highest setting, making it a proper stool for taller users up to 6'2" to perch upon. I'm 5'4". How will this work for shorter users? Users under 5'2" tall can still use the E7 Stool! But we do advise adding a footrest to your setup in order to give you a little extra height and make this stool more suitable to your smaller frame. How comfortable is the cushion on the E7? The E7 Stool by UPLIFT Desk has more padding than its competitors, so you don't have to worry about the seat cushion not being supportive. As always, we don't suggest you sit for long periods of time, so this stool also allows you the freedom to switch up your postures for comfort throughout the day. If you're looking for something for longer use, take a look at the Pursuit Ergonomic Chair by UPLIFT Desk. How does the stool adjust? You can adjust the height of your E7 Stool with a simple height adjustment release underneath the seat. Just take your weight off the stool, squeeze the release, and adjust upwards! Put your weight back on the stool and squeeze the release to lower the stool. Will the E7 Stool tip over while I am perched on it? The base of the E7 Stool is slightly weighted and designed in a shape that keeps it upright, even when perching! However, if you try to balance on the stool or lean too far in one direction, you may lose your balance. What is the fabric on the seat? You'll love the soft, breathable, stain-resistant fabric on this stool's seat. It's soft yet airy, which lets your behind get better airflow than a lot of traditional stools can offer.